Pilot 12 outrageous mechs of epic, skyscraper-sized proportions, each with diverse fighting styles and unique skills. Destroy 3D arenas modeled after actual cities and countries, including Tokyo, Egypt, San Francisco, and Mexico. Gather 2 to 4 friends to engage in party co-op where each player is responsible for one part of a towering mech. Customize your mechs in the Garage, changing their accessories and skins to create your own unique style. 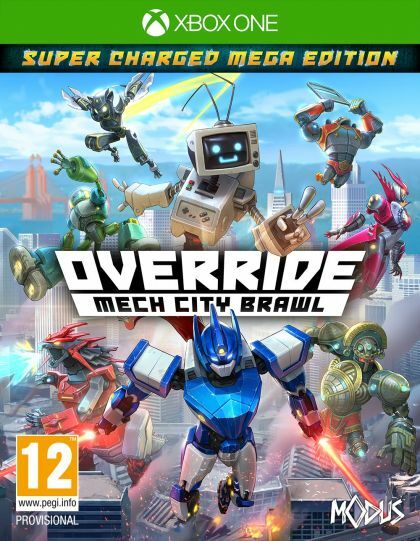 Challenge other players in local and online Versus & Co-Op modes and experience Override’s story in a single-player campaign. The Super Charged Mega Edition includes the Season Pass, delivering 4 extra mechs and 16 new skins post-launch, as well as instant access to 12 legendary skins.